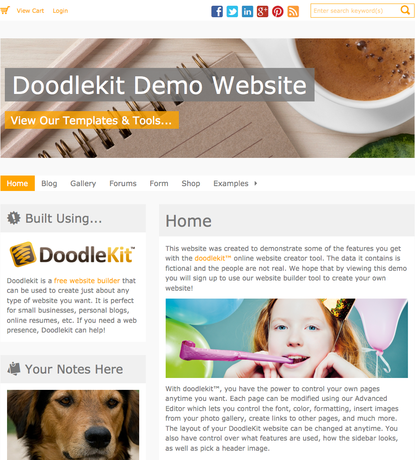 As most of you know, Ben and I recently pushed out the new release code for our free website creator, Doodlekit. You may have noticed some minor new tools and options added, but the bulk of the code has not been turned on yet for members to use. Integrating the new code with the old system did cause some minor issues that have (for the most part) been resolved. Now that the code has been pushed out successfully, I have turned it on for a few select Doodlekit sites that I am testing. You can take a peak at one of these sites here: http://demo.doodlekit.com. As you can imagine with such a big release, I have already found a few bugs. I am currently testing these demo sites and and adding any bugs I find to our ToDo list. Ben and I are knocking these out as fast as we can. It will take several days of testing and bug fixing before we feel comfortable opening up the new release to our members. After I have exhausted my testing and feel that we have addressed every bug that we can, we will open up the new release to our Beta Testing Group. This group is a volunteer group of members who signed up to help us with testing. Not all volunteers will be used as we have way more than we need. You will be notified via email if you volunteered for Beta Testing and we picked you. We will provide you with instructions on what to do and how to report bugs. Once our beta testers have reported all the bugs they can find and we have fixed them all, we will then open up the new release to the public. I will keep everyone posted as to how this is going and if we run into any major issues. Hopefully this will only take a few weeks. Thank you everyone for your patience. We are very excited about this release and hope you will love it as much as we do! Looking good so far. I had a chance to bop around the test site and it looks nice. Cycling the header image is a nice touch. Thanks Jonas :). I think once everyone see the tools they will be completely floored as well - you will be able to change just about every aspect of your templates that you want to. Everything from fonts, colors, borders, shadows, transparencies, gradient colors, etc. All of the templates that we have so far are made using the tools that everyone else will have access to.